ZTE and Cricket Wireless today announced the Grand X Max+, an Android smartphone that boasts a 6.0-inch display and premium design. ZTE has improved the materials and build quality and packed it into a phone measuring 7.87mm thick. 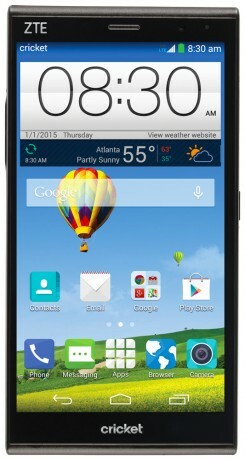 The Grand X Max+ offers high-end features that are available at an affordable price point. The large display offers 720p HD resolution and the phone is powered by a quad-core 1.2GHz Snapdragon 400 processor with 2GB of RAM and 16GB of storage. It supports memory cards up to 32GB. The Grand X Max+ includes a 3,200mAh battery with Qualcomm's QuickCharge 1.0 technology, and it supports LTE, WiFi, Bluetooth, and GPS. The main camera rates 13 megapixels and the user-facing camera rates 5 megapixels and features a wide viewing angle. The phone runs Android 4.4.4 KitKat. The ZTE Grand X Max+ reaches Cricket stores Jan. 9. It will cost $199.99 without a contract.